2018-02-10 14 February Saint Valentine’s Day. It is very wide spread tradition all over the world to congratulate your beloved with Saint Valentine Day. If you have already found your beloved one on our website www.atlantidayagency.com you can order presents for woman with whom you date. Presents are in part «Gifts» on our dating website. If you have not yet found beautiful Ukrainian lady you can check profiles on our dating website Atlantida and to send present to a woman who captured your attention. It is very important to be attentive to ladies because every Ukrainian lady dreams about warm relations and true love. Your small present will inspire woman and who knows may be namely this woman is your future love and destiny! Every February, 14, flowers, and gifts are exchanged between loved ones, all in the name of St. Valentine. But who is this mysterious saint and why do we celebrate this holiday? The history of Valentine’s Day is shrouded in mystery. St. Valentine’s Day contains vestiges of both Christian and ancient Roman tradition. There are many legends about Saint Valentine and the origins of the holiday. Our Ukrainian people also celebrate Saint Valentine Day and this tradition lives in Ukraine too. One legend says that Valentine was a priest who served during the third century in Rome. When Emperor Claudius II decided that single men made better soldiers than those married, he outlawed marriage for young men. Valentine, realizing the injustice of the decree, defied Claudius and continued to perform marriages for young lovers in secret. When Valentine’s actions were discovered, Claudius ordered that he be put to death. And Valentine’s Day is celebrated in the middle of February to commemorate the anniversary of Valentine’s death, which probably occurred around 270 A.D. According to another legend, Valentine actually sent the first ‘valentine’ greeting himself. While in prison, Valentine fell in love with a young girl, his jailor’s daughter, who visited him during his confinement. Before his death, he wrote her a letter, which he signed ‘From your Valentine,’ an expression that is still in use today. Legends usually says that Valentine was a sympathetic, heroic, and romantic person. In the Middle Ages, Valentine was one of the most popular saints in England and France. Now this Saint is also very well-known for Ukrainian audience especially it got popularity among younger generation who are dating. Men and Ukrainian Women greet each other with this day presenting each other presents, flowers and giving each other warm and sweet emotions. But there is a version that the Christian church may have decided to celebrate Valentine’s day in the middle of February in an effort to ‘christianize’ celebrations of the pagan Lupercalia festival. Lupercalia, which began at the ides of February, February 15, was a fertility festival dedicated to Faunus, the Roman god of fertility, as well as to the Roman founders Romulus and Remus. In the day, according to legend, all the young women in the city would place their names in a big jar. The city’s bachelors would then each choose a name out of the jar and would then be a partner of chosen woman for the duration of the festival. Sometimes the pairing of the people lasted an entire year, and often, they would fall in love and would later marry. Pope Gelasius declared February 14 St. Valentine’s Day around 498 A.D. The Roman ‘lottery’ system for romantic pairing was deemed un-Christian and outlawed. Saint Valentine Day became more well known since the period of 90' of the 20 century. Gradually, February 14 became the date for exchanging love messages and St. Valentine became the patron saint of lovers. The date was marked by sending simple gifts such as flowers. In Great Britain, Valentine’s Day began to be popularly celebrated around the seventeenth century. By the middle of the eighteenth century, it was common for friends and lovers in all social classes to exchange small tokens of affection or handwritten notes. By the end of the century, printed cards began to replace written letters due to improvements in printing technology. 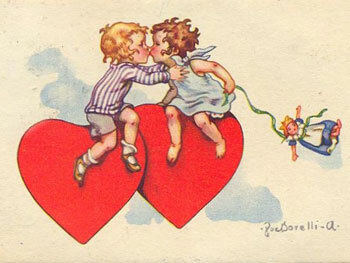 Americans probably began exchanging hand-made valentines in the early 1700s. In the 1840s, Esther A. Howland, known as the Mother of the Valentine, began to sell the first mass-produced valentines in America. The same tendency is wide-spread in Ukraine nowarday and Ukrainian ladies enjoy this Day very much. 1 Valentine’s Day is the second largest card-sending holiday of the year (after Christmas). 2 Approximately 85 percent of all valentines are purchased by women. Nowadays Valentine’s Day is celebrated in many countries of the world on February 14. It is a day on which lovers express their love for each other by presenting flowers, offering confectionery, and sending greeting cards (known as “valentines”). Modern Valentine’s Day symbols include the heart-shaped outline, doves, and the figure of the winged Cupid. This Day gives hope to millions of beautiful Ukrainian women who are waiting for their Foreign gentlemen who will come to them as middle centuries knights armored and with sparkling sword.